first snow, homelessnes, Vancouver B.C. Winter snow pays its first visit but doesn’t even stay for lunch! However, the yer’s first batch of forecast snow on Sunday (February 3rd) was barely a bad daydream, arriving in the morning after breakfast and departing before lunchtime. The accompanying subzero temperatures, though, are expected to stick around for several more days. 9:28 a.m. By the time I finally pointed my camera at the red brick condo the thick curtain of snow had diminished to a single bead. My first waking sight on Sunday was of the snow. 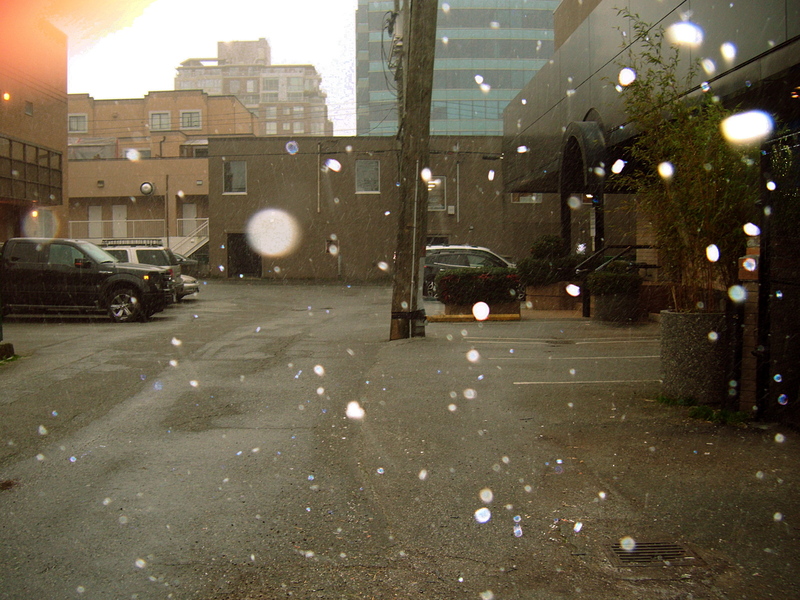 It was falling thick and fluffy, like a veil over my view of the red brick condo across the alley from my parkade sleeping spot in the Fairview neighbourhood. 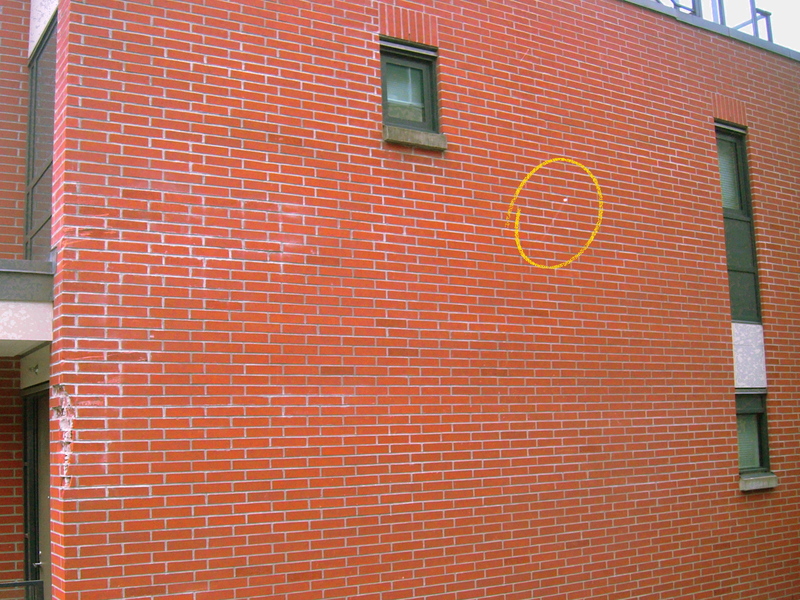 I would have liked to have gotten a photograph of the white stuff falling visibly against the backdrop of red brick. But it took too long to free myself from the winter-weight sleeping bag I had dug out of my storage locker on Saturday, in anticipation of the predicted cold snap. By the time I had my socks and boots and coat on and was poised with my camera to take a photo…the snow had stopped falling. 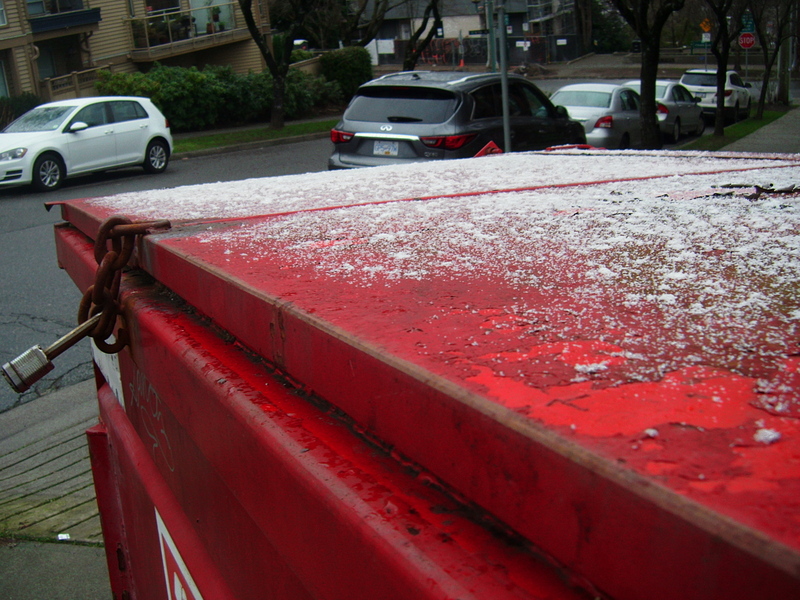 9:27 a.m. A light dusting of snow on the lid of an ice-cold, steel dumpster on Spruce Street.. Seeing as I was dressed I decided to pack up my sleeping gear and venture out into the frosty morning to look for more snow on my way to getting a first hot cup of coffee. That was at about 9:30 a.m.
9:49 a.m. Powdery snow, looking like coarse salt sprinkled on some succulent-looking greens. For blocks after I left my parkade,, the only real concentration of snow that I saw anywhere was a dusting atop the ice-cold enamelled steel lids of a few garbage dumpsters. 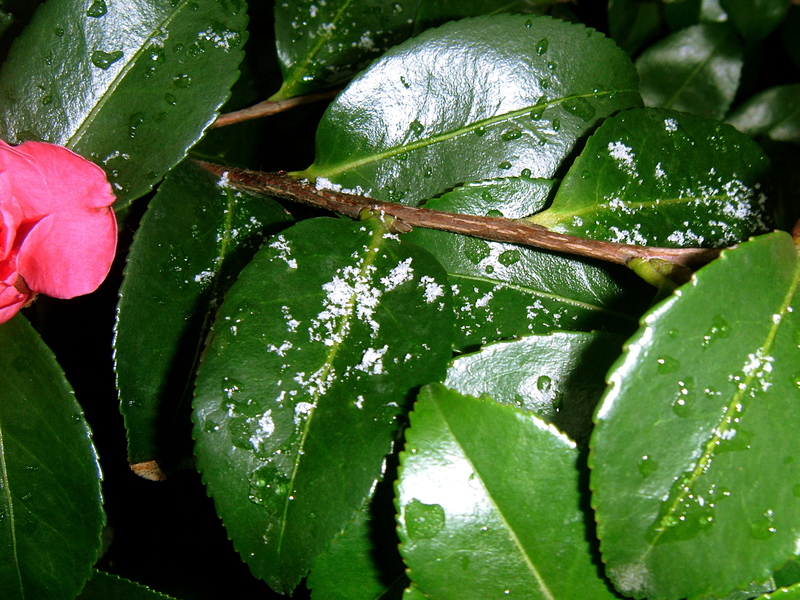 Otherwise the snow persisted only as discreet sprinklings on flower petals and the leaves of shrubbery. 9:55 a.m. A paltry few crystals of icy snow are no match for the blazing colours of spring! It wasn’t until about 10:30 a.m.—when I was almost at my destination in the 1400 block of West Broadway Avenue—that fresh snow began to fall. I was in the alley on the south side of West Broadway talking to a resident who lives in that block on 10th Avenue—the next street south of Broadway. The resident was explaining how he had just finished chasing away two scruffy fellows who had broken into one of the detached garages behind his apartment building. 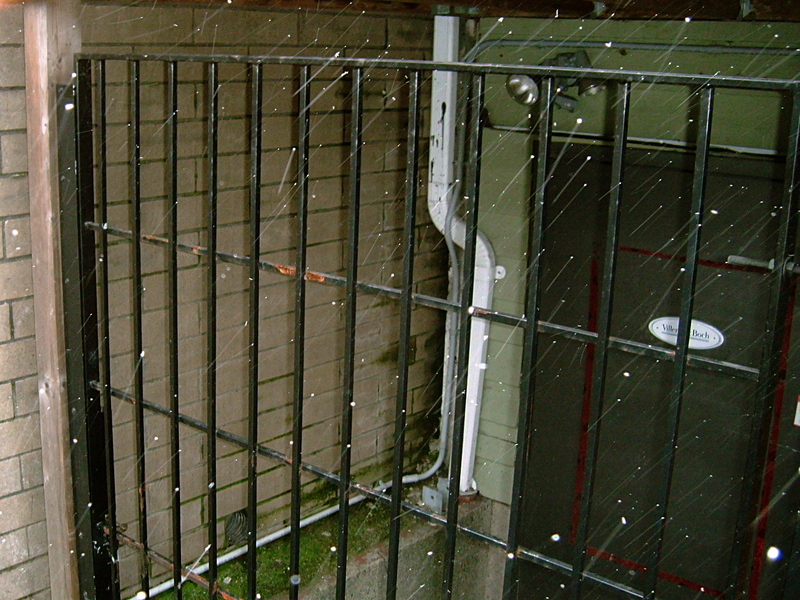 10:48 a.m. A shot of fine snow whizzing by a security gate in the alley of the 1400 block off West Broadway. As the resident explained how he caught the pair in the act and how they had then bolted in the direction of West Broadway—leaving behind an organized stack of items they had apparently wanted to to make off with, the snow suddenly began falling again—if not furiously, then at least flurriously. 10:49 a.m. 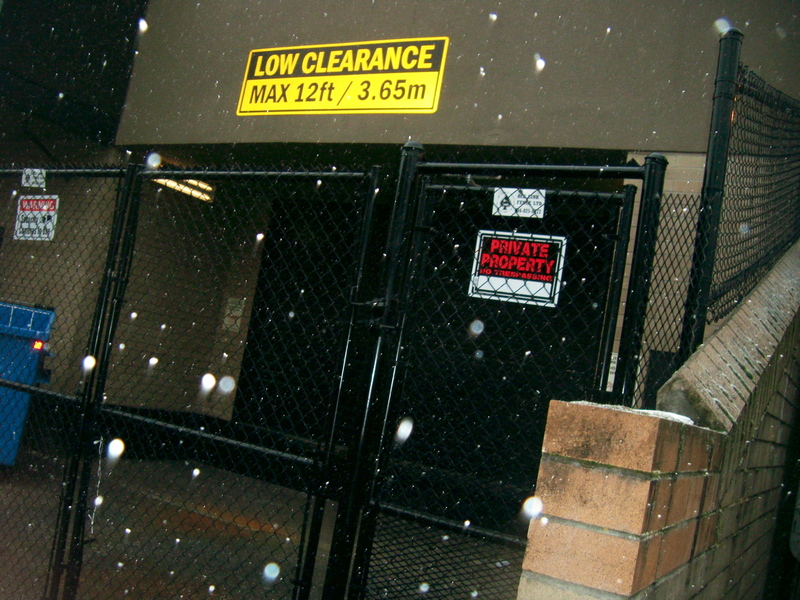 Snow falling before another recently gated loading bay in the same alley of the 1400 block. I distractedly asked the resident if he had called the police. The reply was “no”. He honestly couldn’t tell if the would-be thieves had actually managed to steal anything. With that I left him to ponder his damaged garage door and I went about snapping my last few photographs of the morning snow, such as it was. 11:19 a.m. A City of Vancouver Streets, Traffic and Electrical Operations truck, armed with a snow plow and load of rock salt, zooms through the 1400 block of West Broadway. Once I was seated over my breakfast and coffee inside the McDonald’s restaurant in the 1400 block of West Broadway the snow again abated—this time for the rest of the afternoon. 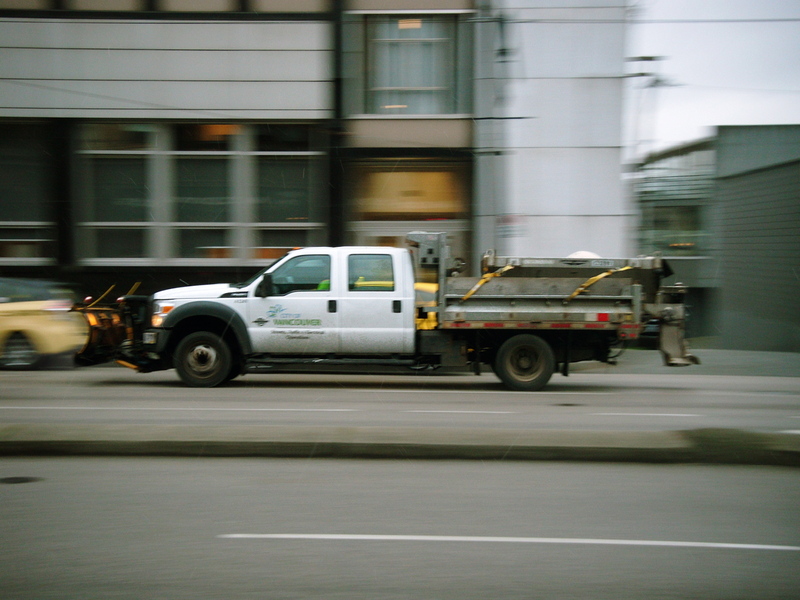 At the same time, I watched a succession of salt-filled City of Vancouver plow trucks making their way along the snow-free, westbound lane of West Broadway, indicating that someone in the know expected that the snow would be back before long. Update: Ten hours later, at about 9 p.m. the snow did indeed begin falling again! Click the images to enlarge them. 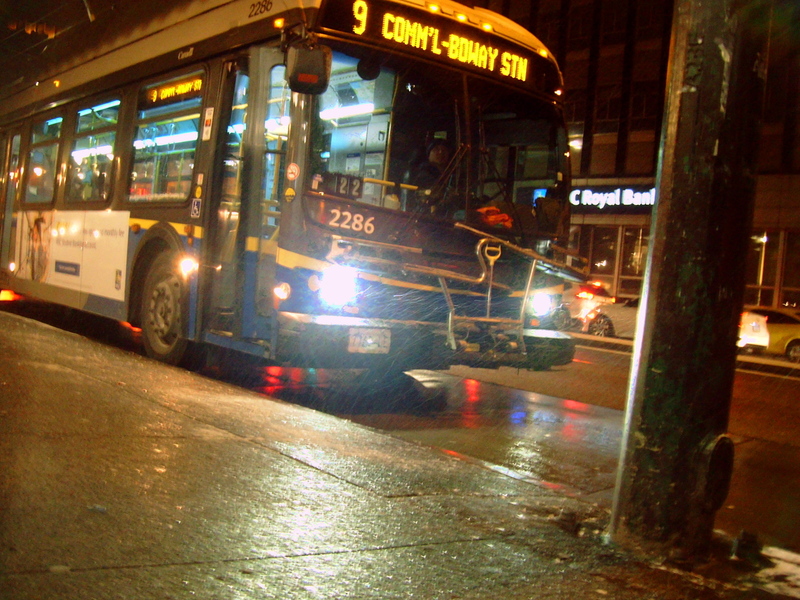 9:21 p.m. Fresh falling snow in the headlight of a 9 Boundary bus in the 1400 block West Broadway. 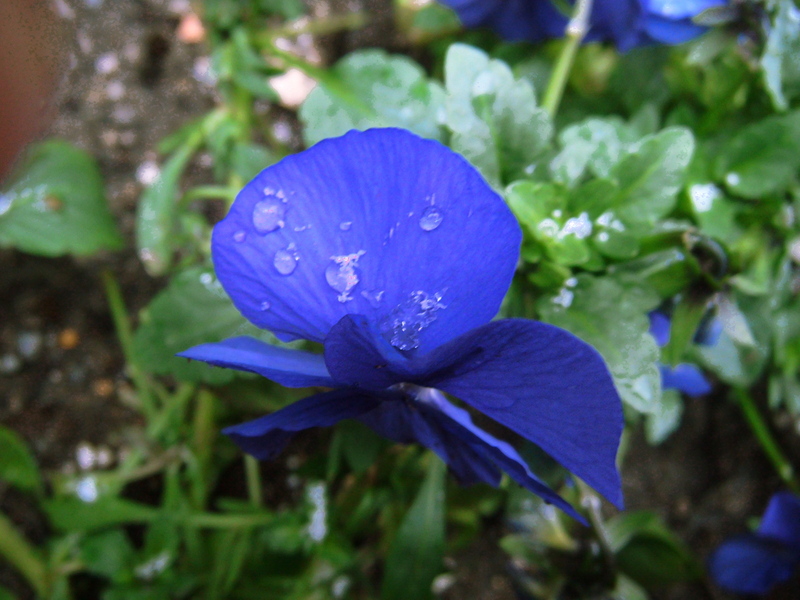 I really enjoy your blogs, a very different perspective of living in Vcr. hope the cold weather doesn’t last too long and affect the cherry blossoms 😀! Indeed. But a little cold and snow (a very little) makes the hot coffee taste that much better! So much for winter tease. Yup, only minus eight today. Sunny and blue skies.